Back sleeping is one of the most common sleeping positions; however, it's great for spine and neck health as it maintains strong alignment to reduce potential pain. Despite this, it’s essential to get a pillow to support your sleeping position with the right materials and size because no single pillow ’s suited to everyone. We’ve created this buyer’s guide to review the best pillows for back sleepers. 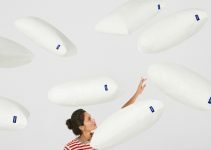 Simba Sleep is one of the fastest growing mattress companies in the country, so it’s no surprise they have extended their offering into pillows. This pillow is made from soft memory foam which contours and shapes to the curves of your neck while providing a supportive shape. It essentially gives you a customised pillow that gives you optimal comfort and rest. If you’re sleeping on your side, this ensures that your spine is in a better position and cradles your head while evenly distributing pressure along your neck, head and shoulders decreasing the risk of strains and aches. The pillow is constructed using 100% anti-allergenic materials which ensure that even the most sensitive sleepers can sleep without being disturbed. The cover is also removable and machine washable for easy care. If you have a common issue of overheating throughout the night, then there is also the option of purchasing this pillow with inbuilt cooling gel to keep you cool while you sleep increasing the quality of your sleep. 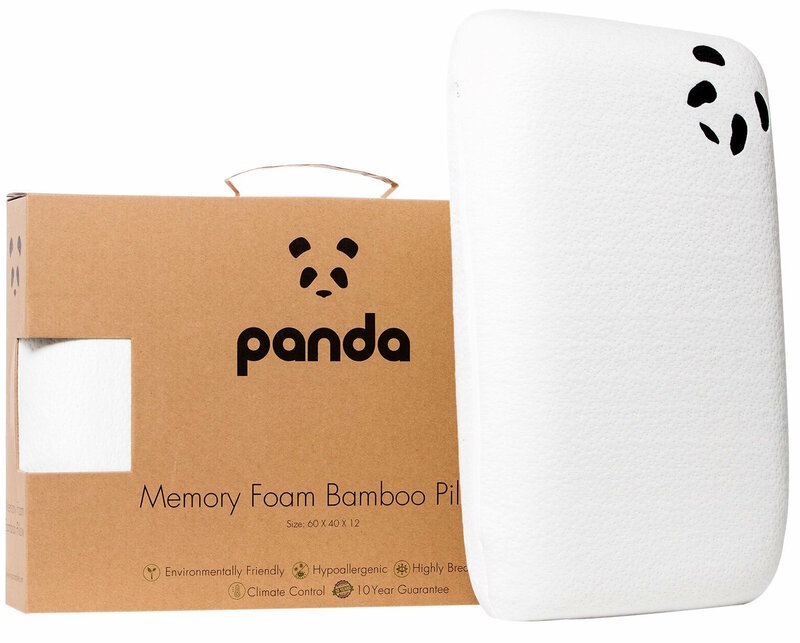 This Original Panda memory foam bamboo pillow is one of the leading memory foam pillows available on the market plus and has a very affordable price point. The pillow has three layers of Visco memory foam using the latest memory foam gel technology which is backed by medical professionals. These three layers provide your back with the support it needs while also being breathable to keep you cool. This means that the pillow will last longer and takes longer for wear and tear to occur such as dents. The temperature regulating technology keeps the pillow cool in the summer and warm in the winter due to the breathable bamboo cover. Bamboo is naturally anti-bacterial and resists mould and mildew. It's great for people who are sensitive to skin irritation and allergies. The height of the pillow is ideal for allowing your back to relax, so you not only fall asleep quickly but stay asleep throughout the night. Also included is a ten-year manufacturer warranty which entitles you to either 100% of your money back or a free replacement. If you need a pillow that provides more support, then this firm Tempur pillow will fit your needs. Tempur was one of the first memory foam pillow retailers and have established themselves as one of the leaders in the market due to their high quality long lasting products. If your neck and head need more support than a medium/firm pillow will provide, then this definitely will suit your needs by keeping your spine aligned throughout the night. When you lie on it, the pillow will contour to the shape of your head and neck as you slightly sink into the fabric. Once you have finished using the pillow, it will return to its original shape. It is a standard rectangle shape so will also fit into the existing bed linen cases that you already own, even though the pillow itself is supplied with a 100% soft cotton cover. Also included is a three-year warranty so if for any reason the pillow loses shape or size then you can return to Tempur for a replacement. Tempur pillows are slightly more expensive than competing pillows; however their build quality and durability more than justifies the price tag. This pillow is ideal for back sleepers and ensures your spine remains aligned for an undisturbed nights sleep. The pillow has a dual contoured design with a pressure relieving core. The larger sided contour is for side sleepers to support the spine whereas the shallow contour is ideal for back sleepers to support your back. The firmness of this pillow is medium/firm which helps to keep your airways open to reduce the chances of snoring. This shape also works to minimise any back or neck pain that you may be suffering from, while also preventing it from developing. Also, supplied with the pillow is a massive 5-year warranty which gives you the peace of mind that this is a long-lasting and quality product. So if any defects occur, then you can either send it back or return to the store and be given a replacement unit. One common occurrence is that a pillow has great firmness when you first receive it, but then it quickly loses this firmness. This John Lewis pillow is different because it retains its firmness. Memory foam pillows aren’t the only solution for back sleepers. 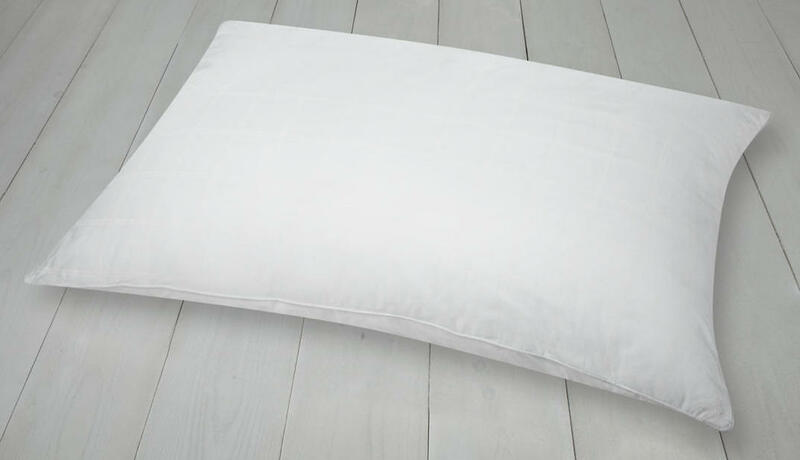 High-quality Down and Feather pillows can also be great if they use high-quality materials and this John Lewis Hungarian Goose Down and Feather Pillow is an example of this. This pillow is filled with Down and Feather sourced from Hungary and has an inner core of duck feather which provides the firmness with the inner duck feather core giving it a firmer outer layer. This means that it can cradle and contour to your head while also providing support to your head doesn’t strain. The pillow has a 233 thread count cotton case which provides a cooling effect while also being smooth to touch. This ensures that it wicks away moisture throughout the night. The case has a NoMite rating, and the is also Down proof due to the tight weave of the cover meaning that no feathers can poke through and not dust mites will be present. So if you suffer from dust mite allergies or asthma, then this pillow will not be an issue. Buying this from John Lewis product gives you a hefty product warranty, of 5 years. Spine-health and alignment are incredibly vital for back sleepers and all sleepers in general. The main advantage of sleeping on your back is that it provides a natural alignment which isn’t affected as much by the firmness of your mattress. By having correct spine alignment, this reduces the pressure on your back, neck, shoulders and hips and lowers the chance of pain developing in these areas. It usually starts as slight soreness but can develop into chronic pain which can negatively affect your day to day life, not just your sleep quality. So, it’s essential to pick a pillow that maintains a positive spine alignment while you sleep. If you currently suffer from neck or shoulder pain when sleeping on your back can help to alleviate these problems. This is because it reduces the pressure along your neck, back and shoulders allowing your muscles and joints to relax. This also ensures your spine remains aligned, so you wake up in the morning feeling refreshed and energised. Not only can the best back sleeping pillow reduce existing pain, but also works to prevent it from developing. So even if you don’t currently suffer from pain, it's a great preventative measure which is more effective than trying to cure the problem when you start to suffer from it. Doctors have determined that the way we sleep can affect how quickly we age both internally and externally. So not getting enough quality sleep can cause you to age at a faster rate, but sleeping on your front or side can place increased pressure on your face which can lead to wrinkles forming. Sleeping on your back reduces the amount of pressure on your face resulting in wrinkles being less likely to develop. Acid reflux is when stomach acid moves up the oesophagus leading to chronic heartburn. If you sleep on your back, then this can make your symptoms worse; however, sleeping on your back can improve airway circulation which can help to reduce the effects of heartburn. Memory foam comes in two forms of either a solid foam block or shredded. But they both share the same quality of softening in shape when your body heat is transferred to it so it contours to the shape of your neck and head providing superior support and comfort. Memory foam is ideal for back sleepers, while shredded memory foam allows you to adjust the height. It also doesn't make much noise when you move to give you less potential disturbances throughout the night. Latex is an all natural substance that is extracted from the sap of rubber trees. Latex pillows are firm which conforms and cradles the head. The loft is non-adjustable which may make it unsuitable for some people as the height may put a strain on the neck. Latex pillows also have great cooling properties to regulate your temperature throughout the night. Down is from either Ducks or Geese and are the soft material found below the outer feathers. Down pillows are soft and lightweight but provide enough support for back sleepers. The loft can also be adjusted to take the strain off your neck and head. Feather pillows are the outer feather of Ducks or Geese and are incredibly similar to Down pillows as they are soft and lightweight yet can provide adequate support. They are usually more affordable than Down pillows, or they may include some Down filling to increase the softness and overall quality. Buckwheat pillow fillings are removable hulls which work individually to create a firm and supportive pillow. It allows you to adjust the loft and airflow through the pillow is efficient keeping you cool. The majority of back sleepers are suited to medium or high loft pillows which provide elevation for the neck and head. It also maintains positive spine alignment and reduces snoring. Lower loft pillows can end causing you issues such as pain and stiffness along your neck, spine and shoulders. In addition to the person sleeping position, you should also consider the firmness of your mattress, head size, body weight and shoulder width. There is often a strong correlation between the cost of your pillow and its overall quality, with the higher quality pillows costing more. It will also be affected by the brand and the filling. You need to ensure that your pillow has sufficient cooling ability, especially if you’re prone to overheating throughout the night. 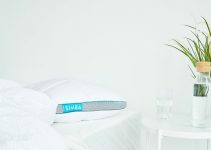 The best back sleeping pillow has cooling technology built into the material to allow air to flow easily keeping you cool throughout your sleep. It may be tempting to get a softer pillow because they feel so plush and nice, but they won’t do a good enough job at keeping your body aligned. Back sleepers need firmer pillows because it will make sure that your head doesn’t sink into the pillow and stay upright for the whole night. 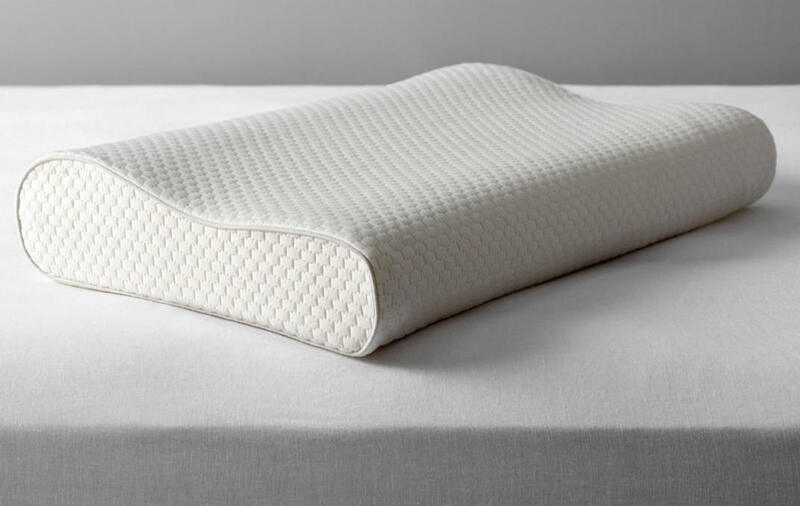 If you’re not used to a firmer pillow, then it will take a few nights to get used to it, but once you break it in it will be worth it in the long term. There’s no point having a great pillow if your mattress isn’t doing the job that it needs to. You should consider getting one of the best mattresses for back sleepers to increase the level of support that you get when you sleep. Your mattress needs to have the right level of firmness and support which keeps you back and spine aligned. It’s normal for a back sleeper to switch between the two sides of the pillow throughout the night. You need to ensure that when you do toss the pillow over, it doesn’t collapse under the pressure of your weight. To make sure, aim to purchase a pillow that doesn’t collapse and keeps your neck and head supported. The best pillow for back sleepers will often come with guarantees and warranties protecting you against any potential decrease in performance. This will entitle you to a free replacement if any defects develop. Depending on the manufacturer this will range from 30 days to years. You also may get free trial periods to give you time to get used to using the pillow to see if it’s the best solution for you. When you think about it, you spend a considerable part of your life on your pillow so it makes perfect sense to spend as much as you can afford because it will benefit you in the long run. If you’re a back sleeper, then the most important things to consider is that you need a firm pillow that provides support to the back and neck while also being comfortable.